Is the South China Sea Anything Like the Ukraine Crisis? Plus, Indian tanks, China’s strategy for Taiwan, the Iran deal, and more. Defense links. South China Sea = Ukraine? 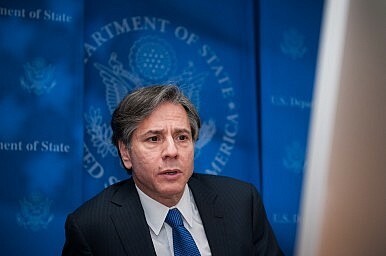 In a statement unlikely to win the United States favor in China, U.S. Deputy Secretary of State Antony Blinken, speaking at a conference organized by the Center for a New American Security in Washington, D.C., compared China’s actions in the South China Sea to Russia’s actions in Ukraine. Blinken specifically framed both situations as “efforts to unilaterally and coercively change the status quo.” Relations between the United States and Russia stand at a post-Cold War low today after Russia annexed the Crimean peninsula for Ukraine early last year. As Andrew Chubb noted recently in The Diplomat, the “status quo” is a tricky concept when discussing the South China Sea and means very different things to different parties. Race to a deal. Little remains certain about the Iran nuclear deal except the fact that we won’t be seeing a final agreement by the purported deadline of June 30. Expect an announcement in the first week of July. Negotiators continue to hammer out details and commit to paper the terms of the April 2 Lausanne framework agreement. Major differences remain between the two sides and the stakes are high. ICYMI. A few recent popular articles in The Diplomat that may be of interest: Gabe Collins breaks down the cost of one of China’s Type 054 Jiangkai-II–-class frigates, Saurav Jha writes on India’s drones, and Kunal Singh takes a look at strategic nuclear stability in South Asia. Crimea: When Is an Annexation Not Actually an Annexation? Three years ago, Russia formally annexed Crimea, citing a flawed referendum.